2017 Chrysler Pacifica Pros and Cons: Why (Not) This Car? Chrysler created the modern minivan in the mid-1980s and for well over a decade virtually owned the segment while competitors experiemented with different approaches without success. But in the late 1990s competitors gave up trying to do something unique and instead focused on incrementally improving the Chrysler formula. Meanwhile, Chrysler dropped the ball with a 2008 redesign. In recent years Honda and Toyota have led the segment. Chrysler and Dodge have continued to sell as many minivans as Honda and Toyota put together, but only by pricing them much lower than the Odyssey and Sienna. For 2017, Chrysler has gone all out to regain class leadership, fully redesigning and re-engineering its minivan. They've even abandoned the Grand Caravan and Town & Country nameplates, dropping the Dodge entirely and resurrecting "Pacifica," previously used on a crossover, for the Chrysler. Does Chrysler seem to have done enough to win customers back from Honda and Toyota? Might the new Pacifica even put a dent in ever-growing crossover sales? Note: this review was originally based on a test drive of a cloth-trimmed Pacifica Touring. Later, after driving a Pacifica Touring-L (the L for leather) for a week, during which I also test drove the updated 2017 Toyota Sienna, I revised and slightly expanded this review. Stylish, well-appointed interior, though clearly that of a minivan. Why the 2017 Chrysler Pacifica? Compared to the Honda's and the Toyota's, the Chryler Pacifica's cargo area is about the same length but is a little narrower and a couple inches less tall. So it cannot hold as many cubic feet. But, as before, only in the Chrysler can the second-row seats stow beneath the floor, making it much easier to configure the Pacifica for maximum cargo capacity. Given how rarely people go through the trouble to remove the second-row seats from other minivans, the stowability of the Chrysler's second row more than compensates for it having slightly less total available volume. The most significant inconvenience in the Pacifica: the front seats must be moved all the way forward before the storage compartment lids can open wide enough to swallow their seats. To assist with this, one or both front seats (depending on trim level) automatically motors forward when the storage compartment is opened then returns to its previous position when the storage compartment is closed. Overall I found both rows fairly easy to stow and un-stow. Especially with the latest refinements the mechanisms seem thoroughly engineered and sturdy. Storage behind the third row is similar to that in the Odyssey and Sienna, so there's about 50 percent more space than in even the largest crossovers. This extra 50 percent could easily make the difference between everyone's luggage fitting and not fitting. For a vacationing family, nothing beats a minivan. When the storage wells aren't being used to stow the seats, they can hold other items. Up front, shelves and compartments abound for whatever you might care to have with you in the car. When I last tested a Chrysler minivan (actually a Dodge Grand Caravan), back in 2011, I was surprised how much they'd improved the ride and handling. Tight, well-weighted steering actually made that minivan fun to drive. The 2017 Chrysler Pacifica doesn't feel quite as firm or as tight as that 2011 in my memory, but it's close. The Honda Odyssey in particular has much lighter steering and a less well composed, jigglier suspension. I've never driven the Toyota Sienna in its sporty SE form, but most reviewers have found the Sienna SE's suspension overly firm. The regular Sienna rides the best of the bunch. The Pacifica rides more firmly than the Sienna, but some drivers will appreciate the more direct connection with the road this provides. Compared to the Sienna, Chrysler's latest minivan handles with considerably more control over body motions and less understeer (plowing towards the outside of the curve). I enjoyed driving it quite a bit more. Hidden door tracks. Blacked-out metal makes the rear window appear to wrap around. Well-designed controls, though I preferred the panel-mounted lever in the old van to the new knob. Like those of the Dodge Dart compact sedan and the Chrysler 200 midsize sedan, the new Pacifica's exterior has fewer edges and more curves than the current fashion. The tested Pacifica Touring wasn't much to look at, but in higher trim levels and in other colors the new Pacifica can be quite attractive. This said, I prefer the sportier styling of the Kia Sedona, and perhaps the crisper lines of the Sienna as well (in sported-up, large-wheeled SE trim). The Honda Odyssey, with a zig-zagging belt line, has the most polarizing styling of the bunch. It's interesting, but not pretty. Update: for 2018 the Odyssey gets all new sheetmetal. The new exterior is sleeker and more upscale, but still odd. Inside, I also like the Kia's more car-like styling the most. But the new Pacifica's interior is also attractive, and it does without the Kia's intrusive car-like center console. In the test driven Touring, brown stitching and trim provided a tasteful contrast to the black fabric. In comparison, the Odyssey and Sienna interiors seem less stylish and more cheaply finished. Top-trim Pacificas have the most luxuriously appointed interiors of any minivan. Their leather, easily worth of a vehicle with a price over $40,000, feels so soft that I wonder how well it will hold up to years of family use. The primary weakness of the new Pacifica's styling, both inside and out: no one will mistake it for anything other than a minivan. In the Kia Sedona I felt much less self-conscious when driving a family vehicle without any family in it. Maybe I'm just being silly. Shifting from aesthetics to functionality, Chrysler's controls are the best-designed in the industry. For the easiest-to-use interface, get one of the systems with a larger screen than in the Pacifica Touring I initially test drove. One thing I like less than in the previous generation Chrysler minivans: a shift lever conveniently located on the instrument panel just to the right of the steering wheel has been replaced by a knob on the center stack. The new Chrysler Pacifica can be purchased with just about anything you can get on a competing minivan, with the notable exceptions of all-wheel-drive (available only on the Toyota Sienna) and lounge-style second-row seats (available on the Sienna and on the Kia Sedona). Want a built-in vacuum like that introduced by Honda on the 2014 Odyssey? You can get one. 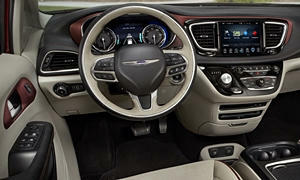 Chrysler also offers features you can't get elsewhere, including hands-free power sliding doors and an entertainment system with embedded travel games and time-to-destination updates. Plus of course Chrysler's exclusive Stow 'n Go seats. Chrysler offers a full array of collision avoidance systems on the Pacifica, among them highly effective automatic braking. These plus top marks in all crash tests earn the Pacifica the highest IIHS safety score of any current minivan. I'd place safety higher among the reasons to buy a Pacifica if the Sedona didn't score nearly as high and if the 2018 Honda Odyssey wasn't likely to at least tie the Pacifica, while also likely to offer safety features at lower trim levels and price points (given what Honda has done with other recently updated models). The Sienna will lag the others until it is also fully redesigned. Why Not the 2017 Chrysler Pacifica? Chrysler has revised its "Stow 'n Go" seats a few times to improve their comfort, and the latest ones are better. But they still feel smaller, firmer, and less comfortable than the conventional captain's chairs in competitors. This noted, unless you'll regularly carry adults in back, and they're picky about seat comfort, the Pacifica's seats should be good enough. A removable center seat for the second row has been added to the options list. With this seat the Pacifica can, like the Sienna and Odyssey, carry eight people in a pinch. But the same seat in the Sienna is much more comfortable. The Pacifica's third row is more competitive in terms of comfort. Roominess in both cases is better than in the Kia Sedona, perhaps about even with the Toyota Sienna, and less than in the Honda Odyssey, which is the roomiest of the bunch. If you're used to a crossover any of these minivans will seem very roomy. The third-row seats in most crossovers aren't in the same league. Chryslers don't hold their value as well as Toyotas and Hondas, in part because they tend to require more repairs as they age. With the new Pacifica, though, both reliability and depreciation remain to be seen. In its natural habitat. We've seen this face before, on the 2015 Chrysler 200 sedan. Though not awful, Chrysler's stowable seats continue to sacrifice comfort for versatility. If you want a pillowy ride that almost entirely absorbs minor road imperfections, get the Toyota Sienna. If you prefer a tauter, more European feel, with better control of large body motions, though, the Pacifica's ride quality could be about perfect. When driving the Pacifica and the updated Sienna on the same suburban roads, both seemed quiet, yet the character of the noise that penetrated the interior differed. The Toyota simply seems quiet, while noise inside the Pacifica seems muffled. Given this quietness in suburban driving, I was surprised by the level of road roar inside the Pacifica on a concrete highway. Unfortunately, I was not able to compare another minivan on the same highway. Also, I tested the Touring, just one trim level up from the bottom. The higher trim levels could be quieter inside. Even the Touring was far from loud. The Odyssey is probably louder and the Sienna is probably quieter. Update: Honda cleaims that the redesigned 2018 Odyssey will be the quietest minivan you can buy. With a 287-horsepower 3.6-liter V6 and a nine-speed automatic transmission, the new Chrysler Pacifica can accelerate more quickly than many owners will ever require. It is, after all, a minivan, not a sports car. Compared to pre-2017 minivans, these specs were the most impressive of any minivan. However, for 2017 Toyota gave the Sienna a bump from 266 to 296 horsepower and an eight-speed automatic transmission. Given these upgrades, I was surprised by how lethargic the Toyota felt. Then I explored the menus of the driver information system in search of the transmission mode setting. Changing this to "power" unleashed the new powertrain's potential. Though I wasn't able to time either minivan, at full throttle the Toyota feels a little quicker--and its engine sounds much louder. Whether the latter trait is a pro or a con will depend on how much you enjoy hearing a well-tuned DOHC V6 charging hard for the red line. Owners have complained about the shift quality of the Pacifica's nine-speed automatic in other Chrysler models. 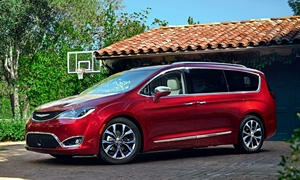 Chrysler has updated the software numerous times, which has addressed some but not all complaints. To date not enough of these transmissions have required hardware repairs to affect the reliability scores of these models, but the transmission remains a potential problem area, or at least a potential source of dissatisfaction. I've personally had few if any issues with this transmission in the cars I've tested with it. Shifts aren't always the smoothest, but not to a degree I'd personally feel was a problem. In some cases the transmission has lugged the engine, to maximize fuel economy, but this won't be an issue with an engine as large and torquey as the Pacifica's V6. I had more of an issue with the Pacifica's throttle calibration, which can be overly aggressive when you first tip into it. Even a moderate stab at the accelerator can unintentionally spin a front tire, especially if you're turning at the same time. Another potential issue: a few times the Pacifica's powertrain hesitated before responding to my right foot's input. The new nine-speed automatic transmission, with extremely tall upper gears, likely deserves much of the credit for an improvement in EPA ratings from the Town & Country's 17 mpg city and 25 mpg highway to the new Pacifica's 18 mpg city and 28 mpg highway. The Kia Sedona also manages 18 in the city, but only 24 on the highway. The updated Toyota rates one mpg better than the Pacifica in the city, but one mpg lower on the highway. With 18 city, 29 highway the Honda Odyssey slightly tops the Chrysler on the highway, probably because it can deactivate up to three cylinders while cruising. Want better fuel economy? Chrysler will soon offer the Pacifica as a plug-in hybrid that will be able to travel up to 30 miles on electricity alone. In my week with the Pacifica the trip computer reported better averages than the EPA ratings led me to expect: 21-22 mpg around town without any special effort, and as high as 26 when making an effort to economize. On a 70-mph highway the trip computer reported 27.5 mpg. Comparing minivans with power sliding doors, the $31,490 Pacifica Touring lists for $1,990 less than the Sienna LE and $1,815 less than the Odyssey EX. But Chrysler has cut dealer margins to the bone. If we compare dealer invoice prices, which are probably more indicative of the actual prices paid than the window stickers, the Toyota costs only $380 more while including about the same in additional content, yielding a wash, and the Honda costs $130 less while including about $500 in additional content. The Kia Sedona EX lists for $195 less and its invoice price is about $500 lower than the Chrysler's. In short, when modestly equipped all four minivans are probably close enough in price that price isn't likely to be the deciding factor (at least not until discounts and rebates come into play). Load up both the Pacifica and the Sienna and the difference shifts a few hundred dollars in the Toyota's favor, but the Chrysler has about $3,250 in additional content, including more collision avoidance systems, more adjustments for the power front passenger seat, cooled front seats, heated second-row seats, and an around-view camera. Load up both the Pacifica and the Odyssey and the Honda emerges with a list price $655 lower and an invoice price a substantial $2,536 lower. Once again, though, the Chrysler has far more content, about $3,700 more in this comparison. And a loaded Sedona SX Limited? It lists for $3,835 less than a $49,275 Pacifica Limited, and over $4,500 less when comparing invoices. Unlike in the other two comparisons, the Chrysler's additional content (about $3,100 worth) can't fully mitigate this difference. In short, when looking at loaded minivans the Chrysler tends to have a small list price disadvantage but likely a significant transaction price disadvantage. To the extent that the Chrysler's additional content doesn't compensate for this difference incentives might have to. I didn't include the tested Pacifica's optional power liftgate ($495) in any of the initial comparisons because this would have bumped the Sienna, Odyssey, and Sedona up to the more heavily contented XLE, EX-L, and EX, respectively. While Chrysler has greatly simplified configurations for its minivan, these configurations remain more flexible than Toyota's or Honda's--you're less likely to pay for features you don't want to get those you do. The 2017 Chrysler Pacifica, the latest minivan from the people who created the minivan, still doesn't have the sportiest styling, the most comfortable second-row seats, or the softest ride. Those who can't get their head around driving a minivan will continue to prefer the Kia Sedona--if they'll consider any minivan at all. Need the most interior space? Then the Honda Odyssey is the one to get. Or the Toyota Sienna for the most absorbant suspension and cushiest seats. But, with both the second and the third row stowable beneath the floor, the Chrysler minivan continues to lead in interior versatility. It also continues to steer and handle the best. The Pacifica redesign adds wins in interior appointments and available features, plus a near-win in fuel economy even before the upcoming hybrid version becomes available. And perhaps a win in styling as well, if your tastes cut its way. Overall, the new Pacifica offers the top combination of style and functionality. The big remaining question mark: will the new Chrysler Pacifica prove reliable? If so, resale values will firm up, and the Pacifica will be the smartest minivan buy, a vehicle I'd strongly recommend for any family. If not, many people will continue to buy the Toyota and Honda instead--if they don't buy a far less functional crossover. Strong engine with competitive fuel economy. Unlike in any other minivan, in the Pacifica you can stow both rows beneath a low, flat floor. Chrysler provided an insured Pacifica for a week. Alan Bradley (248-585-8800) of Suburban Chrysler in Troy, MI, helpfully provided a Pacifica for a test drive. Lawrence Dixon (248-525-0004) of Szott Toyota in Waterford, MI, did the same with a Sienna. 2017 Chrysler Pacifica pros and cons, according to Michael Karesh: the best reasons for buying (or not buying) the 2017 Chrysler Pacifica. Join TrueDelta to post your own impressions. Why would the quality and durability of this vehicle be any better than its predecessors? Maybe they've done a better job, because they know it's very important? As a five year Odyssey owner (current gen), I agree that with this Pacifica, the Chrysler vans have leaped back to being competitive with the foreigners. I felt before that the Sienna and Odyssey were simliarly competitive, depending on what features buyers cared more about, and the ChryCo only were for those who cared about price. I had a rental Pacifica last week for 5 days, on family touring duty, similarly equipped to our Odyssey (leather package), for a pretty direct comparison (albeit to a 2011 Odyssey). Drivetrain - vastly improved. The engine was previously hampered by a transmission that always felt like it was slipping (exact same experience in four different rental vans over the past five years, in different parts of the country even). Although I despised the 9 speed in the new Cherokee (had one as a rental for 24 hours), it worked great here - unobtrusive, gears spaced well and matched to power, no slipping / shuddering. And the engine really is nice - smooth, very nice power delivery, even a nice sound note. Tech / ergonomics - not quite a fair fight, but the uconnect system (the big touchscreen) worked very well, pairing up to my phone and streaming bluetooth. The controls are fairly intuitive, althought the climate controls were a little off (why no sync button or lock rear controls? must use touchscreen, which was annoying). Our older Ody bluetooth is hideous - very slow to connect, cuts out occasionally, gets confused when more than one paired phone is in the car at the same time. Dealer said turn off wifi on our phones should help, but has not made a difference. Just poor engineering (also an older bluetooth profile). I thought the shifter would annoy me, but despite the reflexive looking for a place to rest my hand, I got used to it and it worked fine. It would be nice to have more control over the trans though (the Ody at least has OD lockout plus low gear, so three settings for the five speed - while Pacifica just 'low' and 'drive'). Versatility - I did not test out the stow n go, but I did flip up and down the 3rd row. It has the same design as the old van - it works, although sometimes jammed and is stiff. The Ody is still king with the one strap - especially for those who are less tall. I fit our luggage behind the 3rd row almost exactly the same as in our Ody. The LATCH in the 2nd row captain chairs are hidden (Ody easier to find), and our rental did not have the optional 8th seat (in the Ody, the 8th seat is a real seat and even has LATCH - which is fantastic for the rear facing younguns - the Sienna it is about half of a seat, barely usable). Comfort - ride seemed very similar to our Ody, although the seat was less cushioned making bumps more amplified. Maybe a little stiffer. If I had to purchase another van, I would very strongly consider the Pacifica, whereas I barely glanced at the former version when we bought our Ody and never doubted that decision. Let's see how Honda and Toyota up their game when the next generation comes out. You should strongly consider posting a full review yourself. Very helpful perspective given your Odyssey ownership and experience with the previous generation.